Topics: Vehicles, Reservation, Vancouver Limousine, Fraser Valley Limousine, Chauffeured Limousine, & Richmond Limousine. 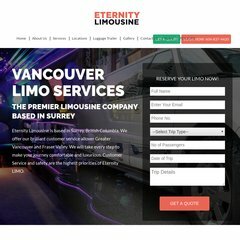 eternitylimo.ca Limousine Service Vancouver, Limousine In Vancouver, Limousine ..
eternitylimo.ca Vancouver Airport Limousine Service, Limousine Vancouver Airport ..
eternitylimo.ca Yvr Limousine Service, Wedding Limo Vancouver, Airport Service ..
eternitylimo.ca Limousine Service Surrey, Limousine Surrey, Limousine Service .. The estimated 35 daily visitors, each view 1.50 pages on average. Its 2 nameservers are ns01.domaincontrol.com, & ns02.domaincontrol.com. It is hosted by Godaddy.com Llc (Arizona, Scottsdale,) using Microsoft-IIS/7 web server. The programming language environment is ASP.NET. PING (184.168.152.41) 56(84) bytes of data. Pinging the server, resulted in a 60.0 ms response.